Our Lady of Sorrows Catholic Church was dedicated on January 17, 1960. Prior to its Homewood location Our Lady of Sorrows was on the southwest corner of 14th Street and Avenue F; after a fire the parish was relocated to Homewood where it has been ever since. Following the move and before the new church was built in Homewood the first Fourth of July Festival was held in 1949. The school began operation in 1951 and the school auditorium served as the church for the next eight years. The priests’ residence or rectory was completed in 1962. In 1985 a handmade organ was installed from the Kenneth Jones Company in Dublin, Ireland. Our current pastor, Monsignor Martin Muller was assigned as Associate Pastor in 1983 and in 1989 was named as Parish Pastor. In 1990 the Botti Studios of Evansville, Illinois began installing the Seven Sorrows of Mary stained glass windows in the church. These windows were dedicated on the feast of Our Lady of Sorrows, September 15, 1991. The stained glass images you see in this website are of these windows. Observance of the Feast of Our Lady of Sorrows, also known as the Feast of the Seven Sorrows of the Blessed Virgin Mary, dates back to 1668, when the Servite friars, who were especially devoted to the sufferings of Mary, were granted a feast on the third Sunday in September. The feast spread to the whole Roman Church by 1814. The Servites have established many churches named Our Lady of Sorrows, but the founder of our parish, Father James Meurer, did not belong to any order. Thus, it is not clear how this name was chosen for our parish. Father William F. McDonough celebrates his first Mass in Jefferson County. The city of Birmingham is incorporated. St. Paul’s, the first Catholic Church in the area, ii completed. Priests from St. Paul’s say Mass in the home of Mr. & Mrs. Frank Anthe on the Southside. Father James A. Meurer is assigned by Bishop Jeremiah O’Sullivan to establish a parish for the German-speaking workers of Birmingham. After St. Paul’s, this is to be the second parish in the city and the second in the county to be assigned a permanent pastor. (St. Catherine of Siena in Pratt City had been operating as a mission of St. Paul’s since 1880). Mrs. Frank Anthe serves as first president of the Altar Society. Father Meurer builds the first Our Lady of Sorrows church on the southwest corner of 14th Street and Avenue F.
School begins operation with Sister Mary Alfonso, R.S.M., as principal. In addition to the three R’s, students are taught music, elocution and languages. The first school building is built. Bishop Allen dedicates the new brick church and blesses the copy of Michaelangelo’s Pieta. The congregation of 1,500 hears Father Boniface Seng, O.S.B., speak on the waters flowing from the temple. A choir of 16 and a violinist provide music. The carved wooden main altar had been the altar at St. Paul’s. When it was damaged in a fire, it was given to Our Lady of Sorrows and redecorated for use in the new church. Father Meurer dies, Father Louis H. Galland leaves Pratt City (where he was the first resident pastor) to become the second pastor of Our Lady of Sorrows. He continues the tradition of preaching in both English and German. Father Galland dies, and Father Malachi Kitrick becomes temporary pastor. Father John O’Kelly takes over as pastor, leaving St. Aloysius parish in Bessemer. In his announcement book, he notes that he will continue Father Galland’s Mass schedule and will keep the same Pew Rents as before. Parishioners erect marble monuments at the graves of both previous pastors of Our Lady of Sorrows Cemetery, near First Street and Sixth Avenue South, the present site of Our Lady of Fatima. Father O’Kelly notes the total number of baptisms for the first 20 years: Children, 57; adult converts, 57; infants, 651. Religious census finds 731 parishioners at OLS. Women at OLS hold a “Pic Nic” at Germania Park (probably the present-day Fairgrounds) to raise money for needed repairs in the cemetery. Holy Name Society Chapter formed. Parish begins annual Bazaar held in June. It was held for the next fifteen years. Mrs. Warren Snead, Sr., served as Chairman of the OLS Altar Society. Red brick school and convent built on southeast corner of 14th Street and Avenue F.
Financial statement shows church debt of $27,888.00. Father O’Kelly thanks parishioners for their valued assistance through the Envelope System, the Spring Drive, the Parish Societies, Socials, Parties, Bazaar, etc., and Pew Rent. Father Edward F. Shea becomes pastor when Father O’Kelly is assigned to St. Peter’s Church in Montgomery. A census shows 225 families and 865 parishioners at OLS. Bishop Toolen approves a section of Elmwood cemetery to be used for Catholics. All graves are moved from Our Lady of Sorrows cemetery. Assistants in this year include Fathers Hugh J. Duffy, T.L. Flynn and Herman C. Cazalas, also Director of Missions in Central Alabama. C.C.D. Religious Vacation School enrolls 91 children from OLS, St. George and St. Elias parishes. OLS Parent-Teacher Association formed, with Mrs. Lee Hughes the first president. OLS Catholic Youth Organization, with Floyd Stephens as president, is recognized on a national radio broadcast for their monthly bulletin. Father Shea dies, and Father John O’Sullivan, assistant pastor, takes over as temporary administrator. Father Timothy J. Pathe is assigned pastor, leaving St. Anthony’s in Ensley. Our Lady of Sorrws Praesidium of the Legion of Mary is organized. Father Pathe initiates “Sorrowful Mother” perpetual novena. Father Francis J. Foley is appointed as pastor when Father Pathe leaves to become an Army Chaplain. Father Thomas Sadler is appointed temporary assistant. On Thursday, early a.m., after Ash Wednesday services the night before, fire breaks out in the furnace room in the basement and sweeps through the church, which had been recently renovated at a cost of $15,000. Firemen fight the blaze for five hours while parishioners work to set up the school auditorium for “Mass as usual” at 6:30 and 8:00 a.m.
Bishop Toolen offers Father Cazalas his choice of property in Mountain Brook or Homewood to rebuild Our Lady of Sorrows. The Homewood site is chosen, and the first Masses are celebrated in the brown house near the present location of the kindergarten classrooms. An enduring tradition begins with the first Annual Fourth of July Festival. School begins operation with Sister Nathanael as principal. Archbishop Toolen dedicates the first building at the new location. It includes 9 classrooms, cafeteria, auditorium and convent. The school auditorium serves as the church for the next eight years. A four-classroom addition to the school building is blessed. Two houses are purchased on the Eastern end of the lot. One stood where the front parking lot is now and the other is presently the church office. Midnight Mass is the first service celebrated in the church building, dedicated January 17, 1960. Total cost of construction was approximately $500,000. Father Cazalas is invested with the title Monsignor. The new rectory is completed adjoining the church. Joseph Canary heads the committee which organizes the Parish Council. William Sullivan, Jr. is elected the first president. A new addition to the school is completed, containing six classrooms and offices. The school library is completed. The CYO House and the Herman C. Cazalas Gymnasium is completed. After 28 years at OLS, Msgr. Cazalas is reassigned to St. Stanislaus in Wylam, and Father Patrick Murphy returns to OLS as pastor. Father Charles Bordenca and Father Matthew Brennan are assigned as Co-Pastors. Father Martin Muller, in residence at OLS for many years while on the faculty of John Carroll High School, leaves John Carroll and becomes Associate Pastor of OLS. The handmade organ is installed from the Kenneth Jones Company in Dublin, Ireland. Father Pascal A. Ferlisi, a native of Birmingham and of the Order of St. Benedict, is assigned to OLS. He was previously a member of St. Bernard Abbey in Cullman, Ala.
Father Muller is named Administrator for the parish. Father Muller is named pastor for the parish. Sister Janet Marie Flemming, O.S.B. comes to OLS from the Benedictine Sisters in Cullman and is named Director of the Spiritual Life Office replacing Sister Therese. The Our Lady of Sorrows School Foundation was established to assure the survival of the Our Lady of Sorrows Catholic School. The school is a regional school dedicated to academic excellence and serves Our Lady of Sorrows, St. Peter’s, Prince of Peace, St. George and St. Elias Parishes. The goal of the school is to provide students with a special kind of education, one that not only recognizes and meets the needs of the individual but also teaches through example and experience the ideals of the Catholic faith. Father Jeffrie Reynolds is named associate pastor for the parish. The Botti Studios of Evansville, Illinois begins installing the stained glass in the church. The various windows depict the Seven Sorrows of Mary. Bishop William Dermott Molloy, of Huancavelica, Peru dedicates the 500 seat Church of St. Joseph the Worker in Bellavista, Lircay, Peru. The church was built entirely with the donations from OLS parishioners and proceeds from the OLS Fourth of July Festivals. Father Juan Jose is the pastor. Sister Margaret Liang, O.S.B., the Director of Religious Education, leaves OLS to work in the missions in China. Sister Janet Marie Flemming, O.S.B., head of the Spiritual Life Office, leaves OLS to be appointed Sub-prioress with the Benedictine community. Father Muller hosts a reception for both Benedictine Sisters thanking them for all their contributions to the parish. Mrs. Patricia Higuera returns to OLS as Director of our Parish School of Religion beginning in September. She had previously served as the PSR Director from 1978 to 1980. The Knights of Columbus donated $30,000 toward the new “Knights of Columbus” building used by the school during the week and by the Parish School of Religion and A.A. during non-school hours. Father Muller announces that Lee Bruno’s challenge to the parish to match funds to $100,000 has been achieved. An anonymous donor offers to match up to $25,000 to of additional donations made by parishioners. Sister Thomas Jude is named the new Minister to Sick & Shut-Ins and organizer of Bible Groups. She is a Trinitarian nun and the parish is delighted she chose OLS for her new apostolic ministry. Under the leadership of Ida Wilker and Mary Claire Brouillette, Perpetual Adoration started on Saturday 15, 1992 at 9:00 a.m. In the previous months, parishioners signed up for at least one hour each week in the Chapel of Our Savior for a devotion to our Lord’s presence in the Eucharist. The chapel is located on the side of the church office facing the church. The choir, under the leadership of the Director of Music Robert Sullivan, makes a pilgrimage to Rome, Italy. Father Muller announces that the parish will be getting a second Trinitarian Sister, with the arrival of Sister Pat Sullivan as the head of the Ministry to the Sick, while Sister Thomas Jude moves to be the Director of Religious Education. The choir loft (now called the balcony) is extended adding 100 seats of pew space in the choir loft. At the same time, the Ave Maria Shoppe is enlarged providing additional room for religious materials and items. The OLS School Foundation, established in 1991, has grown to $800,000. Father Muller announces another individual has agreed to match donations collected up to $100,000. The Angelo Bruno Family agrees to donate $1,500,000 if the parish raises $500,000 to completely renovate the OLS School. With the renovation of the Homewood Library, Father Muller discusses purchasing the former Electrician’s Union building to obtain additional parking space. The Parish School of Religion (PSR) building is to be built next to the Knights of Columbus Building. It will provide additional classrooms and office space for the 450 students on Sundays and the 50 catechists. Father Muller announces that funding for the OLS School renovations is complete and the project will be finished in the summer of 1996. The OLS School Foundation reaches the $100,000 matching fund goal and the anonymous donor agrees to match all new donations until the end of the year. The Parish School of Religion (PSR) building is completed next to the Knights of Columbus Building providing additional classrooms and office space. Father Muller announces the parish raised $128,282 in 1995, and the anonymous donor matched that amount bringing the OLS School Foundation total to $1,131,000 since 1991. Father Ferlisi, O.S.B. celebrates the Silver Jubilee of this Ordination to the Holy Priesthood by inviting the entire parish to participate in a solemn Mass of Thanksgiving. A reception is held in the Parish Hall following Mass. Father Muller blesses the newly completed Our Lady of Peace Patio in the back of the CYO House. The Our Lady of Peace Guild developed the area as a Shrine to Mary. Father Muller announces the parish will be adding an elevator to the northwest corner of the church to accommodate the elderly and handicapped of the parish. The parish purchases the former Electrician’s Union building and parking area to obtain additional parking for the parish. The choir goes on their second pilgrimage to Rome, Italy. The parish gave Father Muller a surprise birthday party in the Parish Hall to celebrate his 65th birthday. Every family received an invitation in the mail. Bishop David E. Foley blesses and rededicates the newly renovated OLS School. The new elevator is now operating and being used by the parish. Father John Delchos from the Archdiocese of Baltimore conducts his firth mission at the parish. As always, he fills the church each night with his spiritual energy and love for God. 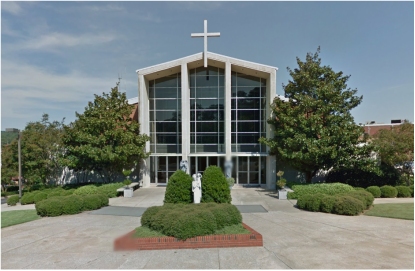 Father Kelly is assigned to be pastor at St. Williams in Guntersville, Ala., and Father Sean Merino is named associate pastor. Father Kelly reluctantly agreed to a fond farewell with a reception as long as there would be no roast. Father Sean, a native of Decatur, comes to OLS from Holy Spirit Church in Huntsville where he has been a priest for 3 years. The parish celebrates the fifth anniversary of Perpetual Eucharist Adoration on the Feast of the Assumption of Our Lady with a procession with the Blessed Sacrament from the chapel to the church. The event includes the Knights of Columbus Honor Guards, OLS choir, and a Mass. An appreciation dinner was held for everyone in the Parish Hall following the Mass. Father Sean Merino is assigned to be associate pastor at St. Peters in Hoover, Al, and newly ordained Father Gerald Holloway is named associate pastor. Bishop Foley dedicates the renovations to the Chapel of Our Savior (Adoration Chapel) and the gym. The gym has installed a new wooden floor and added two meeting rooms. The church office is also renovated. Father Pascal A. Ferlisi, a diabetic since early childhood, dies. During his ten years at OLS, he lost both legs and his left arm, but never was he deterred from continuing his priestly ministry and duties at the parish. His determination, spirituality, and religious knowledge are missed by all. Renovations begin to modernize the CYO House and the Bruno Room. Bishop Foley grants his permission for the parish to purchase a new “mini bus” for the church’s disabled parishioners to use. The van is also used by other organizations at the church. The parish celebrates the 50th Annual OLS Fourth of July Festival and raises $39,000. The proceeds go to the Knights of Columbus charities (10%), the OLS School (45%) and parish (45%). The One Voice reports the parish leads the diocese in pledges to Catholic Charities with an incredible $455,000. Renovations are completed on the modernization of the CYO House and CYO basement. The parish donated all proceeds, totaling more than $45,000 from the 51st Fourth of July festival to go toward purchasing materials for three new chapels in three Catholic communities in Matamoros, Mexico. Father Michael Seifert, who grew up at OLS and is the son of OLS parishioners Mr. and Mrs. Gordon Seifert, spoke at each mass thanking the parish on behalf of all of the 6,000 families he works with in Mexico. New stained glass windows were installed in the Chapel of Our Savior and were designed by Diane Meyers from Statesville, North Carolina. A new handicapped restroom was installed in the church. The parish completes its latest modifications to the campus after borrowing $400,000 for the following: renovation of the parish hall kitchen, the new women’s and handicapped restroom in the church, the renovation of the kitchen in the nursery and the new Catholic Learning Center on the other side of the CYO House, as well as a new storage room for the Ave Maria Shoppe. The tabernacle is moved from the front, right of the church to a more prominent position behind the main altar. The church installs the Divine Mercy painting of Jesus along with a painting of the Assumption of Mary. These paintings are hung on either side of the church at the front of the sanctuary. Father Thomas Ackerman leaves OLS to become the pastor at St. Williams in Guntersville, Ala., and Father Joseph Palathingal leaves St. Francis in Mountain Brook to become the associate pastor at OLS. Father Joseph Palathingal leaves to study in California and Father Jose I. Manjaly comes to Birmingham to be the associate pastor of OLS. Father Jose I. Manjaly leaves OLS to become the pastor of St. Frances of Assisi in Talladega and Father Michael Deering accepts his first assignment as an ordained priest to become the associate pastor at OLS. The parish celebrated with great joy and thanksgiving the 10th anniversary of Perpetual Eucharist Adoration. The celebration was held on the feast of the Assumption of the Blessed Mother. Celebrating the Mass with Bishop Foley were Father Muller, pastor; Father Deering, associate pastor; Father Emmanuel, in residence; and Father Ed. T. Hartel, a visiting priest from Washington, D.C. A covered dish dinner was held in the parish hall after Mass. The Chapel of Our Savior reopened at 9:00 p.m.
Father Muller learns that Rome has conferred the title of Monsignor to him. Newly anointed Monsignor Muller reluctantly agrees to allow the parish to host a congratulation party in the Parish Hall only after Bishop Foley has a friendly talk with him. There was a huge turnout by the parish, former students and many others to celebrate his new honor. Deacon Joe Lody was ordained on October 4, 2003 and conducted his first Mass on October 5, 2003. The CYO house closed on April 4, 2004 and demolition began in May, 2004. A farewell reception was held on June 4th for Fr. Deering who is leaving OLS to pastor St. Elizabeth Seton in Gardendale, Ala., and Fr. Lody who was assigned pastor to St. John the Baptist Church in Huntsville, Ala.
Fr. Jim Hedderman joined the Diocese and was assigned to OLS. Fr. Don Bosco Forsythe joined OLS. Construction begins on the new Family Life Center and parking deck. Construction on the new Family Life Center and parking deck as well as the new “facelift” for the church office is completed. Bishop Foley offers Mass and blesses the Family Life Center and parking deck. Fr. Don Forsythe leaves OLS to be the Administrator of St. Francis of Assisi in Talladega, Al. Fr. George Vattappara joins OLS. The new Parish Library opens in the Family Life Center. Farewell reception is held for Fr. George who is leaving for Holy Spirit in Huntsville. Welcome to Fr. Larry Schinnick who is joining OLS. The Atrium and Catechesis of the Good Shepard Program, an approach to the religious formation of children ages 3 – 12, was developed. On May 20th a Mass of Thanksgiving commemorating the Golden Anniversary of the priesthood of Monsignor Martin Muller is celebrated followed by a reception in the Family Life Center. Fr. Heddermann leaves OLS to be full time in education at Catholic High in Huntsville, Ala.
Fr. Shinnick leaves to pastor at Demopolis, Ala., with three missions. Welcome Fr. Jim Booth and Fr. Jose Chacko as new Associate Pastors. Blessing is offered for the new door for the Chapel of Our Savior. The door was purchased by families of Ida Wilder and Mary Claire Brouillette in their honor. This was the 15th anniversary of the Chapel. Announcement of our new Bishop, Robert Baker, is made. Installation of Bishop Robert Baker is held. Discussions of the building of the new Columbarium begin. Permission was granted from Bishop Baker to build the Columbarium. The proposed cost is $300,000. Fr. Jose Chacko leaves OLS for Our Lady Queen of the Universe with the Mission of Sacred Heart in Collegeville. Fr. Jim Booth will no longer be teaching at John Carroll and will now be full time at OLS. Construction begins on the new Columbarium and the Memorial Wall. Retirement celebration is held honoring Sister Joan Harrington and Mrs. Diane Zicarelli. Construction is completed on the Columbarium and the Memorial Wall. Fr. Jaya Reddy joins OLS.